You know how much I love a good weekend breakfast or brunch (a lot!). I look forward to filling the dining room table with food and sitting down for a leisurely meal with my husband and son. The little man finishes and usually takes off after a while but my husband and I linger at the table for a long while just chatting and enjoying a few cups of coffee. Above all else, I like eating and being at home these days. But I also make it a point to go out once in a while (especially on Sundays for brunch) and take advantage of some of the amazing restaurants available to us, as we live so close to NYC. I try to mix things up and in our latest outing a few weeks ago, we went to Amy Ruth's in Harlem. It's known for soul food and, specifically, the fried chicken and waffles. We'd been there many years ago but thought it would be a nice change to head there again. We had a good breakfast at Amy Ruth's and our favorite dish turned out to be the smothered fried chicken, served with white corn grits and eggs. I realized I'd never cooked grits despite how much I love similar things like porridge and oatmeal. So I was inspired by that breakfast outing to cook grits for breakfast back home! I love when inspiration strikes. Here we have breakfast of grits, bacon and eggs, with a side of toast. Nothing too out of the ordinary but so hearty and satisfying. One of the things I liked about the grits at Amy Ruth's was how it was a great blank canvas for the smothered chicken. I asked the server whether the grits were cooked with water or milk and she told me, as I suspected, that it was made with just water. I was happy to hear it and I did the same at home. You can source good stone-ground grits but for a novice like me, I settled for the quick cooking kind easily found in a canister. You know what? It tasted just like the one at the restaurant. You don't always get inspired eating out but it's such fun when it happens. I keep a little list of restaurants to try out for brunch and I'm hoping for some good meals as well as a little inspiration to take back home every now and then. There's really no "recipe" for this post. Essentially - let's have grits for breakfast! I cooked up some grits in as basic a form as it gets - I made it with just water and salt, following directions on the box. To finish, you could stir in a little dab of butter, or some bacon bits, maybe a little bit of cheese, if you like. Just as well, you can leave it alone and scoop it up and serve it alongside some bacon and eggs. I called it my "Southern-style" breakfast...I love a good theme to any meal! ...and the fried chicken and waffles they're well known for. Not long ago, we brunched at Balthazar's. I love the buzz and vibe there, and the food is great. Similarly, there's Laduree in Soho. It's such a feminine place but the fellas are great company. I always want to skip the "food" and go straight for dessert, no matter what time it is! I realize I really do love a cozy, warm bistro or brasserie. I loved going to Buvette, which is in a tiny space that packs so much charm. They're known for their plates of steamed eggs. We had just seen the movie, BFG (Roald Dahl), and it was very appropriate because we felt like giants sitting at our little table. Lafayette is another spot though far roomier. We had a great morning there, sitting in the cheerful and bright atmosphere, enjoying our coffee and breakfast. I'm looking forward to going back. My son loves pizza so we tried Motorino not long ago. Does anyone else love a good octopus salad, by the way? Once in a while, we drop the forks and pick up our chopsticks and go for dim sum (okay, some of us still use forks). there's nothing like a good breakfast...at the local diner! For that, head to New Jersey, our home for the last almost-10 years! I could go on but I think I better stop here for now! Thanks for visiting and I hope you have a great week! May there be lots of good meals whether enjoyed in the comfort of your home or thanks to the hospitality of a good restaurant! We need both in our lives, I think. Thanks so much. There are so many gems in Manhattan but Buvette is so lovable...just a great warm spot that you step into and feel like you went to a different time and place. Everything was darling. Hope you have a lovely weekend, too. 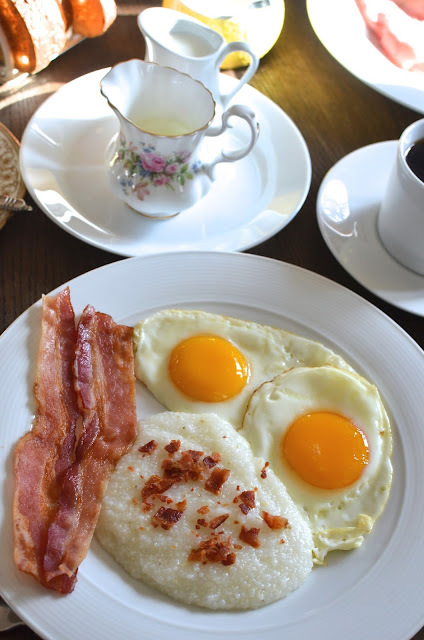 Have never had grits..that breakfast/brunch did look very satisfying and delicious. I think you would enjoy it easily. You've been having some great meals out and about ... and at home! We love grits and my husband often makes them for breakfast. I like butter and lots of pepper on mine. Now I want to go out for breakfast and try a new place! Thanks for the beautiful inspiration! So many meals - it's weird that I almost have to "make" myself go eat out these days. What is wrong with me?! But it is almost always fun and I'm glad we had the little outing when I look back. Well...it's snowing here today so I'm just home baking; no brunch outings this weekend but plans are in place for next weekend! Enjoy! I love weekend brunch - be it sweet like bread with jam or savoury like scrambled eggs with mushrooms... I love them all! Grit is something new I've never heard of, sounds interesting! And P.S. I tried my first octopus salad in Croatia last year and I was SO in love, it's damn delicious! I am actually much more of a savory breakfast/brunch person but I can be tempted with sweet as well. Everything is worth savoring. And if you like porridge/oats and corn, grits are great in a savory breakfast! And octopus salad is everywhere these days and I'm glad for it...so good! Your weekends sound perfect! I love weekend brunch - so fun seeing all the places you guys went to. They all seriously look awesome! It would be so fun to have brunch together. 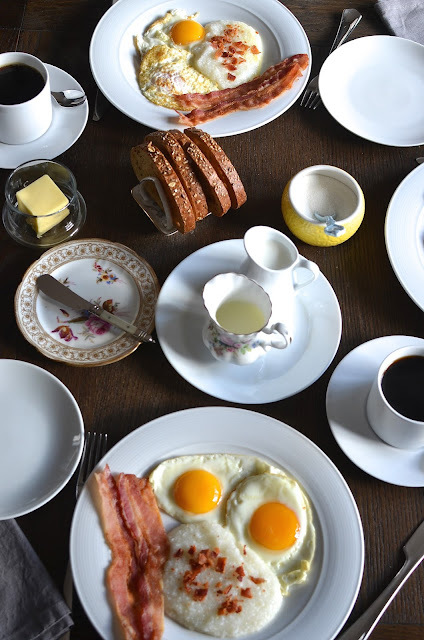 I'm with you though, as much as I enjoy the experience of dining out, my favorite for now is still at home and your "Southern" style breakfast would be a hit here. Looks delicious! Oh yes - I'd love to sit down to a brunch with you, Kelly!! I do have to make it a point to put these brunch outings on the schedule; otherwise, I nearly almost always will want to stay put at home. haha. Enjoy the weekend! How perfect are these 2 sunny side up eggs. and grits You know when my youngest boy was growing up, he would say mama I want a substantial breakfast. He was only 3 at the time so you have to imagine how fun that was! I think I need to move in next door to you! What time is brunch today? That looks lovely! I deeply believe in the importance of shared family meals! We normally don't have such routine on weekends because my husband love playing golf or doing exercise early and my daughter wants to catch up on sleep. But on weekdays we certainly start the day together and it really does make for a better day. Have a great weekend! What a treat to be able to have breakfast together on the weekday! That is wonderful and I know we all agree on the importance of shared family meals. They really are the best. Oh yes - shrimp & grits. I've never cooked it at home and I am trying to remember if I've ever had the pleasure of eating it though I've seen it enough. Delicious! I love a good, healthy and filling breakfast! Who wouldn't want this for breakfast or anytime of the day:) YUM!! Hi Monica, sounds like breakfast at your house is really special. We love grits but have only had them maybe twice. Beuatiful way to start the day. Thanks for the restaurant recommendation - I'll put it on my list to try sometime when I'm in New York! I love recreating restaurant recipes at home too. Sounds good. it's definitely wonderful to be inspired when you eat out. I like to eat things that I can't or wouldn't want to make at home but sometimes, you get lucky and it's something simple you can make a part of your repertoire at home! I never knew you lived near NYC.. It is always nice to take breaks now and then. I'm the same, as I've gotten older, I love to stay home. Only reason we get out is a break for the boys. Leisure breakfast is so good. Love it. Hope you are doing good Monica. Hi Asha! Hope you're well! Yes, we are in NJ so it's a quick drive and we try to take advantage. Same with you, we make more trips and more outings to eat mostly for the little one's sake. It's all good! We're doing well, btw...a "rare" snow day here today! It has been years since we were in NY...I am loving all the food pictures...they sure look great Monica. As for grits, I had it before, but not in breakfast...as it is very versatile...I would love with some butter and maybe cheese. Amazing the variety you get only for breakfast when living in a big city!!! All we get around here are eggs and bread rolls and jam. Which is nice but still... beyond comparison.